Sankampang District of Chiangmai is the heart of the handicraft industry. Many of Thailands major producers are located here and youll find all of the traditional crafts of the old days and the new in the shops along the Chiang Mai - Sankampang Road. This half day tour will give you the opportunity to see quality local authentic artisan made products. Elaborate teak-wood carvings, intricate silverware, lustrous black lacquer ware, high-fired ceramics, famous Thai silk and cotton being woven the ancient traditional way on rustic wooden looms, paper-making and silk parasols in a rainbow hue of dazzling colors. Watch skilled artists deftly and swiftly paint art-work on parasols. It’s absolutely amazing. There is additional charge for Hotel Pick up/Drop off in other areas. Please click Here for the list of hotels pick up/drop off service and extra charge. (Reservation staff will charge separately). Please call Hippo On Tour Number : +66 2 1166767 or +6686 3394174-75 for further information. Please be at the hotel lobby at least 10 minutes before the pick-up time. The tour guide will be waiting for you at the hotel lobby and will be waiting maximum 10 minutes after the advised pick-up time. In case you cannot be located or contacted, the tour will commence as scheduled and payment for unused tour will not be refundable. - Please be aware that when you book with us, please use the same name that you use when you check- in at your hotel in order to avoid any misunderstanding when our tour staff comes to pick you up at your hotel lobby. - In case you advise us different name when you book a tour, please call to inform us your room number before your tour date to help us locate you. Failure to advise us your room number may cause you to miss the tour bus (no show). Hippoontour reserves the right not to give you back any refund in case of no show. Driver or Tour Guide Tip is not included in the package price and it is at your discretion. We recommend you to bring sun block, sun glasses and hat for your protection. Itinerary maybe changed subject to traffic situation / or weather condition. Customer name entered in the booking form to follow passport. For entry visa and transit visa, passports should have a minimum of 6 months validity after completing the journey. It is the customer responsibility to obtain all Entry Visa or Transit Visa. It is customer responsibility to check carefully for any errors made in the booking details, flight itineraries and travel vouchers immediately upon getting them. Please pay attention to the billing currency indicated on the package. Billing currency would be the currency in which you will be billed in. Prices are subject to surcharges during Peak season and Holiday season. 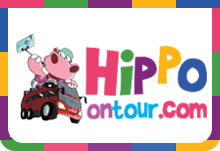 Hippo On Tour staff provides advisory information but do not undertake any responsibility whatsoever for any changes of information. Prices and ticketing conditions are subject to change without prior notice before issuance of travel voucher. Prices are not guaranteed until travel vouchers are issued and full payment has been received. Any cancellation /amendment will be subject to charges. Please refer to Hippo On Tour Cancellation/Amendment Policy. All packages are non-transferable and non-exchangeable. Any amendment after travel vouchers have been issued will be considered as a cancellation of the existing booking. Cancellation charges will be applied accordingly. Please refer to Hippo On Tour Cancellation Policies. Email address must be correctly furnished. As a customer, you agree to accept email as a means of communication and delivery of Travel vouchers and confirmation of your booking. In doing so, you agree not to hold www.hippoontour.com liable for any non-receipt of travel voucher or email confirmation. As an additional measure to protect our customers, www.hippoontour.com may request for photocopies of your credit card (back and front) and a Credit Card Authorization Payment Form to exclude the possibility that the card is being used by a third party, even after payment has been made. As a customer, you agree to cooperate and provide the necessary documents to www.hippoontour.com if such a need arises. Tickets are not to be used for touting purpose. Tickets are sold for foreign and inbound visitors to the park.